A fun superhero film that focuses on the camaraderie of the heroes over the threat of the villain. Vitalized by a restored faith in humanity due to an alien hero’s sacrifice, a billionaire seeks the help of a demigoddess heroine to face-off against an ancient evil. Together they recruit a team that includes a human machine hybrid, a delinquent from a mythical royal family and a young man able to tap into an alternative energy source, to save the planet from an assault of apocalyptic proportions. Bruce Wayne is Batman who rededicates himself to saving the human race after the selfless death of the Kryptonian Kal-El, known as Superman to the world and Clark Kent to his friends, by forming a league of super powered beings. Diana Prince is Wonder Woman, an Amazonian warrior who joins the Justice League with knowledge of the threat that is returning to Earth. Barry Allen is Flash, who is the fastest human alive by drawing from the Speed Force and is recruited by Bruce Wayne to join the league. Arthur Curry is the Aquaman who joins the league out of guilt for shirking his duties as heir to the throne of Atlantis. Victor Stone is Cyborg who is being cybernetically reconstructed by other-worldly technology that is connected to a malevolent battalion preparing to invade the planet. Steppenwolf is an extraterrestrial from the planet Apokololips who was exiled from Earth after losing in battle and has come back to finish what he started by using Mother Box technology to terraform it. 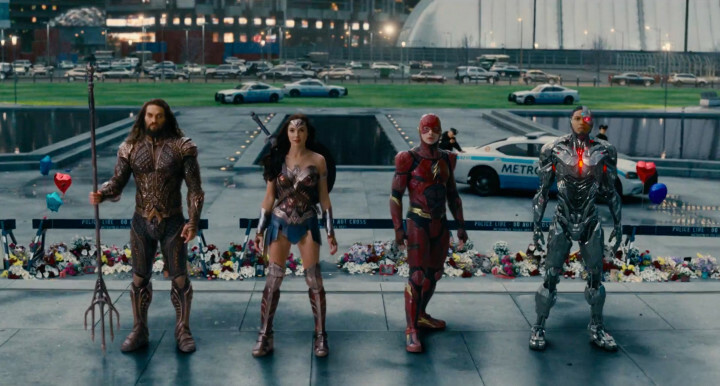 Justice League is a fun movie that gives us a modern taste of some classic larger than life heroes. This movie is able to lighten the tone of the previous DCEU movies while brightening the outlook of their world in general by injecting elements of hope in the actual heroes. The cast is able to bring charisma to the characters they play that endears them to the audience and allows you to feel good cheering them on. Zack Snyder and Joss Whedon are able to deliver a movie that feels uneven at times but drives home the message of heroism in a way that is earnest and worth it. The special effects were at times overwhelming in their execution but work in firmly placing you in the metahuman world that these beings inhabit. The score was full of nostalgic overtures due to Danny Elfman but in certain scenes the music did not fit the updated version of the heroes we have come to expect. This film is able to bring awesome superhero action in a cool way that may not be as fresh as you want it to be, yet is undeniably enjoyable in its delivery. I rate this movie a rating of 4 out of 5. There are two after credit scenes so make sure to keep watching the movie beyond the main story. The first gives us a taste of a classic rivalry between two heroes and the second reintroduces us to a villain devising plans to form a team with the potential to incite chaos.